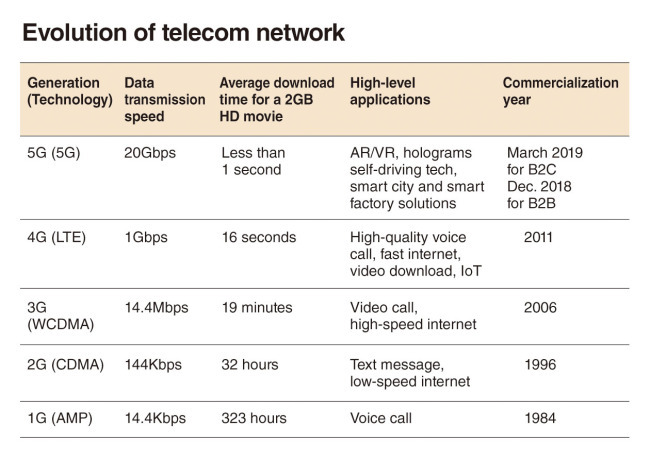 The Year 2019 will be a cutthroat yet exciting year for South Korea’s telecommunications businesses as the introduction of faster fifth-generation telecom networks in March augurs upheavals in their own and other industries. Compared to the current 4G Long Term Evolution mobile network, the 5G network provides 20 times faster speed for data transmission, allowing users to download a 2-gigabyte high-definition movie in less than a second. Because it is crucial for the mobile operators to provide ideal content for the 5G network infrastructure in order to preoccupy the new network market with new subscribers, the country’s three mobile carriers -- SK Telecom, KT and LG Uplus in order of sales -- are preparing to acquire or seek partnerships with small and mid-size broadcasters or media content startups. No.1 player SKT is forging ties with over-the-top mobile video content provider Pooq, run by the country’s three terrestrial broadcasters, in order to strengthen its own platform Oksusu that aims to rival Netflix. This is also part of SKT CEO Park Jung-ho’s plan to establish an intermediary financial holding company – dubbed “ICT holding company of SK Group -- that take control of the current four business areas of SKT. KT’s New Media Business Group will be led by Kim Hoon-bae, former CEO of Genie Music -- the mobile carrier’s music streaming platform -- this year, which will focus on developing creative 5G content for its customers. The company is also expanding Olleh TV subscribers’ access to TV content further to their mobile devices by launching Olleh TV Mobile application.